What is tactical urbanism anyway? Say you think your street’s a bit of a crappy place to be, and want to improve the experience it gives people. Instead of doing options testing on paper and trying to figure out what will work best before crossing your fingers and implementing it for real, you do 1:1 scale trialling – get real feedback from people in real life, and everyone can see what’s working and tweak things as you go. Then, after a good period of this, you decide together whether or not to keep it – informed by rich real-life data. This is tactical urbanism. It’s not guerilla urbanism – it’s done officially. It’s not a popup never intended to stay – it’s with a view to long term improvement in that spot. Steve Burgess has done a lot of this stuff around Australasia (he’s also an expert on parking). He’s a great speaker – punchy, clear, sweary in that quintessentially Aussie way which is somehow okay, and insightful. Here are some bits that stuck out for me. When you ask people what they want to see on a street or space, or when they come to you angry (usually) about something, it’s often “more parking, our businesses are suffering cos people can’t find a carpark” or “there’s too much congestion we need more road space”. And ask us directly whether we want to turn some space that’s been used for cars to being only for people, and we’ll invariably say “No! We’d lose something important! What do you mean cars aren’t helping here? Go away you’re so out of touch, [Council] idiots”. Ask us, and we’ll say what we want. Loud and clear. “My business is declining and I’m worried about my livelihood, and it feels like it’s all on me (and out of my control) at the same time”. “I’m spending too much time on travelling (and – enragingly – sitting in traffic) that I should be spending on family, friends, work…”. And those people who said “No way José” to the “loss” of car space on a street are invariably amongst the overwhelming majority of folks who actually care most of all about public spaces being green, safe, universally accessible, welcoming, clean – easy to park in or drive past is a long way down the list. 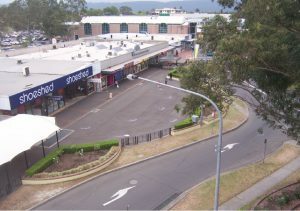 For example, in rigorous research of what 3,000 Sydneysiders cared about most in their streets, ease of parking was the highest-ranking car-related thing and it came in 27th – 27th – behind a slew of other people-centric values. Greenness, safety, accessibility, welcome, and being clean were invariably in people’s top 5 or 10. Now we’re not allowed to build a street of the scale and the “stickiness” that people like to be on. The Austroads guidelines, adhered to religiously by the road design establishment, say you have to have this width and that amount of parking so this volume of cars can move freely through it, so obviously they need this much space. People – the point of cities – are literally pushed to the edges. Traffic engineering, constrained by these rules, has been given the first cut at all our roads and streets – so doing right by their trade, they design according to the rules. It’s good if you’re a car but it’s terrible for humans – but that’s the rules we’ve made ourselves. We build places to live that are objectively bad for humans – they suppress our natural physical activity, our ability to know our neighbours, our tendency to walk down to the local shops and drop in and say hi to people. You have to hop in the car to do almost everything outside your property. And we’re still building them. We don’t know how to do this people-centric streets stuff. We’ve forgotten (if we ever knew in Australasia). So don’t do the traditional “waterfall” design and planning process led by experts that ends up with option that offends the least people being Built (with everyone’s fingers crossed it will work because your town’s never done this before and the councillors will have your guts on a stick if it doesn’t work). You do this and do this and see how it’s working, and eventually people will be in a position to make a call about whether they want the changes to stay. And nine times out of ten they do! Makes sense really: they’ve been able to actually experience it, not just look at visualisations or pictures, and the problematic kinks have been sorted out. Tactical urbanism is about learning. Everyone can see and experience, and everyone should see the data about how it’s working – from human experience and from gadgets. 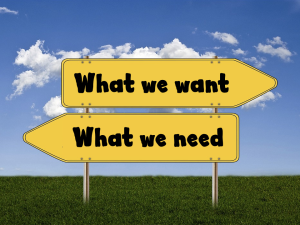 What surprised us – what turned out to work, or not work, against our or my expectations? Did we think it’d be carmageddon and congestion (of course, or at least lots of people did) – but was it really? Really? 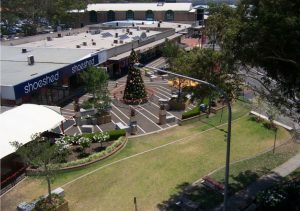 Did the urban designers’ ideas actually work in practice once real people could have a go experiencing them? What did people who used it actually feel? No, really, did we ask them how they felt in it? What little tweaks were effective at ironing out niggles, which we should remember for any other street? What ways of doing things together were more effective or even more fun? Is it actually worth the hassle of going around my neighbouring businesses and us coordinating so we can hunt as a pack? Did it work to try to bring people together for meetings at Council, or was it better to have them on the street? For once Council didn’t “own” this one, what worked and didn’t work about that? Wellington’s flirted with tactical urbanism – Bond St, below, is our best example. 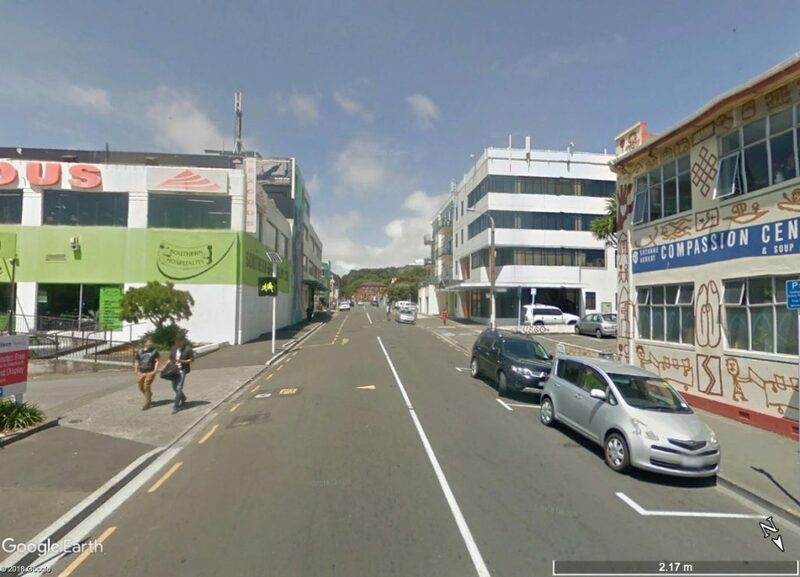 Trying to retrofit a car-centric street to make it more hospitable to people: Bond St. Wellington city’s best (only) example of proper tactical urbanism? But recently, we’ve not done it very well. Reimagining Tory Street experienced classic “what I want” vs “what I care about” reaction, amped up in this DomPost piece (some thoughtful coverage by Newshub here) and was wrapped up and put back to car-only space despite being a decent stab at a tactical urbanism project. Did we learn anything, apart from “it’ll be kinda cool, but some people will yell lots then Council will can it? Where in your ‘hood would you like to see some tactical urbanism trying new layouts for the street? 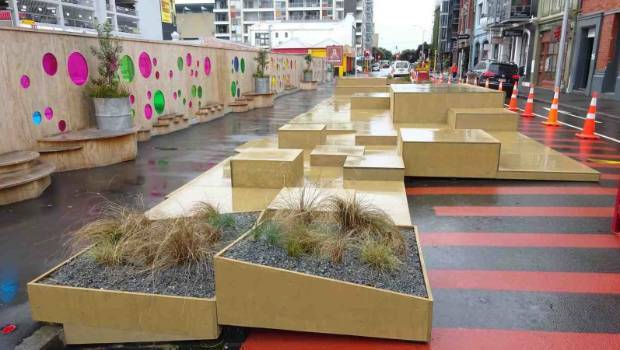 Can we try some to reshape the city streets with Let’s Get Wellington Moving? 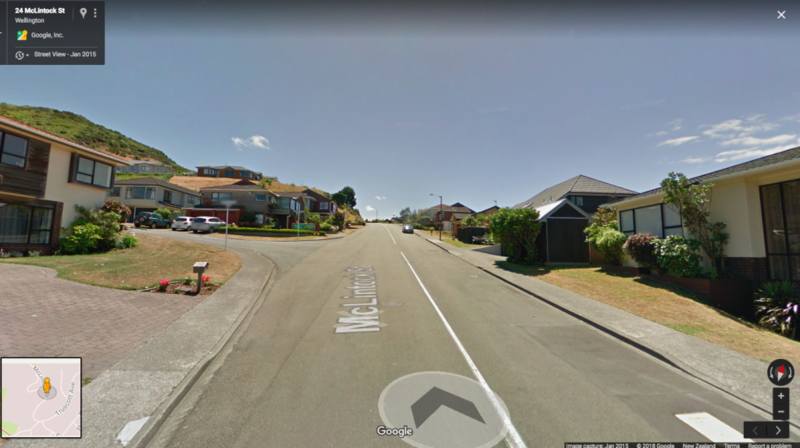 Mark your diary and bring the kids (and bikes, kites, mini soccer ball) for a large-scale one-day popup of people-centric open streets: Wellington Open Streets, Te Ara Tapere o Pōneke, 28th October!